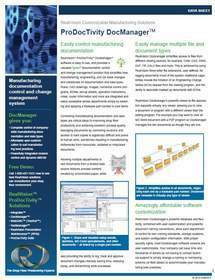 EAGLE, ID--(Marketwire - February 9, 2010) - RealVision, Inc., an innovator in affordable, practical and customizable manufacturing solutions for the shop floor, today announced the release of ProDocTivity™ DocManager™ 5.0 software. This new release provides enhanced usability, engineering change notice (ECN) functionality, search capabilities and more, simplifying how manufacturing, engineering and QA track changes and collaborate documentation and data types. Plans, CAD drawings, images, sketches, NC programs, BOMs, set up sheets, router information, and more are integrated and easily accessible across departments simply by selecting a part number. With RealVision Connect™ ODBC framework, connecting to IT systems and manufacturing applications, including ERP and databases, is easy. "Our software is very affordable with extensive documentation and change management capability; it complements existing ERP systems while offering companies a deeper relationship between shop floor operations and manufacturing and engineering documentation. RealVision software is a great way for companies to go 'green' too with a paperless solution," says Gil Chacon, RealVision, Inc., VP Sales and Marketing. 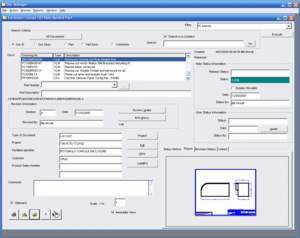 Controlling manufacturing documentation and data types is a critical step to improving shop floor productivity. Managing documents by controlling revisions and access to hard copies is logistically difficult and prone to human error, sometimes resulting in manufacturing bottlenecks due to inaccurate or outdated documents. Reducing process barriers created by uncontrolled paper while allowing multiple departments to use documents from a shared data source, and the ability to log, track and approve document changes, saves time, reduces scrap and streamlines rework. RealVision DocManager 5.0 solves these problems by offering a complete document and change management solution that scales from small business to enterprise-level shop floors. navigation so engineers and managers can make more informed decisions. approve ECNs for streamlined workflow. criteria, boolean searches and filtering. sources for prototyping and testing. --  SMNP support for email applications that cannot support Microsoft MAPI. a simplified MES (manufacturing execution system). and economical shop floor productivity solution portfolio. With 25 years of experience, RealVision customizable manufacturing solutions' expert knowledge of shop floor operations is built into each product. Built by engineers for engineers, these practical solutions easily adapt to manufacturing environments to provide the efficiency and flexibility needed to increase shop floor productivity, integrate tooling data with CNC, reduce scrap, maintain equipment life, and manage production systems. Contact RealVision today at 1-800-487-1031 to learn how RealVision can boost your business' bottom line, or visit www.RealVisionMfgSolutions.com. About this company RealVision, Inc.